This song was composed for my sister Djinnie who owns and rides an Icelandic horse. She needed music for a riding competition called "Tølt in Harmony" which is a brand new style where the objective is to display harmonic riding style in the special gait Tølt which is unique to Icelandic horses. I was measuring the pace of her horse so the music would fit. So the music had to run at 102 bpm. It had to be not too dominating. So I wrote a long chord progression and some melody lines and recorded this song. How did it go? It didn't. The horse had its own will and refused to stay in the transporter. It was splitting it apart. So she never started. But the music is there for next time. There is an extra twist to this music. When Thierry (thsantac) and Iqbal (ihussain) started on the Triangular Sandwich, we needed something to start from. So I sent Thierry and Iqbal the chord progression played in a different style and slower tempo. And then first Iqbal and then Thierry composed based on that. I had already done this horse song so I reused one of the melodies in Triangular Sandwich. 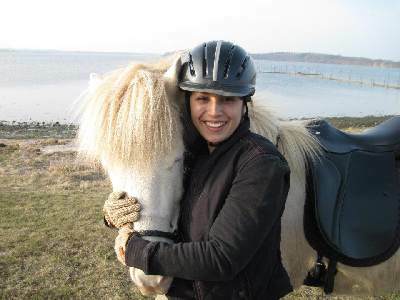 The picture is my sister Djinnie and her horse.